Your machine roars to life, you can feel its engine vibrate with every pull on the throttle. Feel the cold wind on your face and breathe the crisp air as you fly through a frost-tipped forest beneath the bluebird sky. Cresting a mountain — an alpine bowl opens up just over the ridge — calling to you, inviting you to test your mettle against its pool of snow. It’s brilliant out here — magnified by the chilled air — crisp, clear and exhilarating. Give that throttle another tug. Feel the snow spray and arc as you hammer through it, howling with laughter. Round another bend to boondock through the backcountry, flying along through timbered passages and snow-covered meadows. 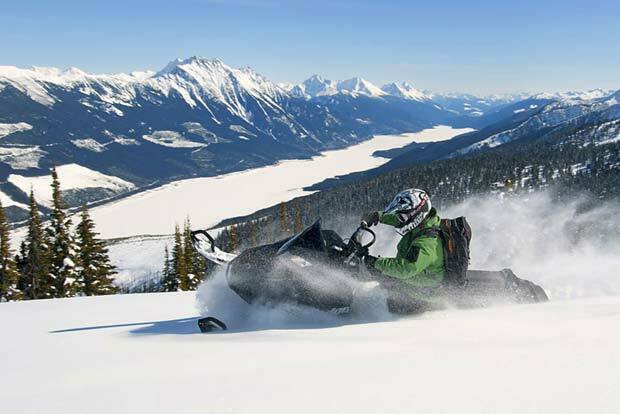 There are no limits out here — so go ahead let that throttle out — only then will you experience the adrenaline-fuelled sledder’s rush of snowmobiling in the North Thompson Valley. 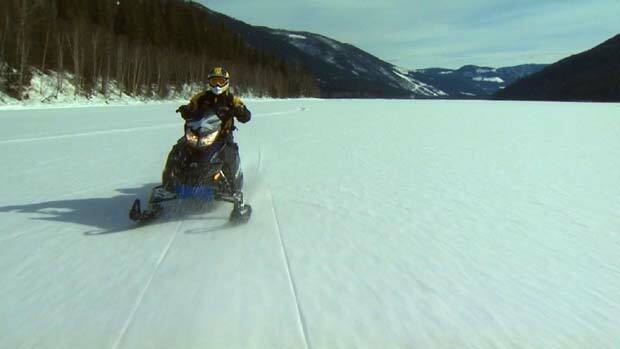 Glide along a frozen lake. Plow your sled through backcountry bowls of powder. Seek some chills and find some thrills. The sledding at Sun Peaks Resort is family-friendly and adventure-fueled. Bring the whole family along. 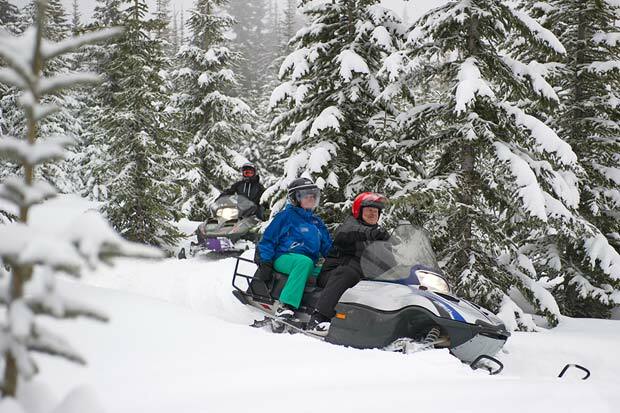 Sun Peaks Resort offer two and four guided snowmobile tours that zoom along frozen routes, over snow and ice-covered lakes, and through a wintry forest. Sign-up for a night ride and experience the winterscape illuminated only by your snow machine and the twinkling stars above. Then, warm up at McGillivray Cabin with an old-fashioned wiener roast around a glowing fire. These are the kind of magical experiences that bring out the kid in everyone. Come on out for some brazen family fun! 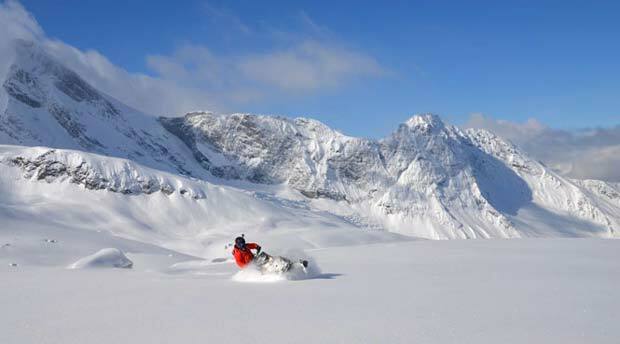 Further south along the Yellowhead Highway is a snowmobiler’s paradise, where the mountains reach the sky and the dry, shimmering powder is just waiting to be explored. There’s a reason seasoned sledders flock to Blue River. It’s where more than 60 km (37 mi) of groomed and tracked trails (and even more snow-covered thrills above the ridgeline) combine with up to 6 m (20 ft) of annual snowfall. It creates rides that are both epic and easy-going. Suit up. Step outside your door and onto your machine. Point your skis to Groundhog Mountain where avalanche-free trails make for family-friendly rides. For more excitement on the snow, make your way over a frozen creek bed and fly straight up to the alpine. The frozen tundra is calling. Answer it! Valemount is where you ride at the doorstep to the Rocky Mountains. Look up to the craggy peaks of the Monashees, and the rolling summits of the Cariboos. 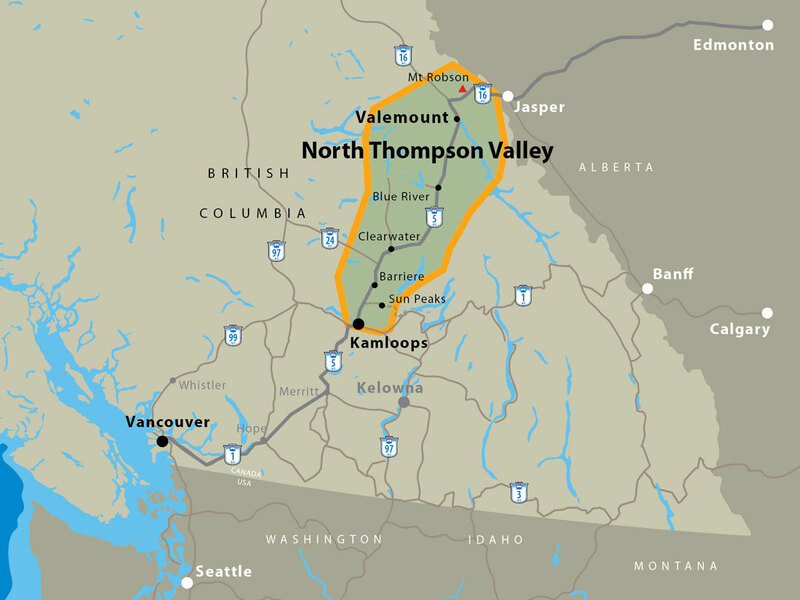 These three mountain ranges define the rare landscape that surround Valemount. They also give you limitless riding possibilities. Saddle up to ride rolling hills and grasslands blanketed with snow. More experienced riders love the high mountain passes. Make your way to the Crystal Ridge Sled Ski Area for a one-of-a-kind experience. It is open to the public and offers six, semi-cleared runs (2200 vertical feet each) with a designated uptrack for snowmobile travel. Strike out on your own or play follow-the-leader with a group of friends. You’ll be rewarded with heart-stopping winter panoramas usually only seen on postcards.